I’ve always enjoyed keeping my herp pets, and those I’ve cared for in zoos, in outdoor ponds and exhibits. I see a wider variety of behaviors and have better breeding results, and the access to natural sunlight and wild insects is very beneficial for the animals. The arrival of winter, however, ends the fun and brings special challenges. Today I’ll cover indoor and outdoor hibernation of terrestrial and aquatic turtles and frogs, and review what to do if you wish to keep your pets active year-round. Hibernation is risky under the best of circumstances. Each spring, I see evidence of winter die-offs among free-living reptiles and amphibians. The safest option for most pet owners is to keep your animals active and feeding throughout the winter. Reptiles and amphibians native to temperate climates may not reproduce unless subjected to period of dormancy. However, in many cases a short, cool resting period will suffice – true “winter” in not needed. Details vary widely as to species, so please post below for further information. It has been theorized that hibernation enhances the long-term health of those species that do so in the wild, but there seems to be nothing of substance published to this effect. During my long career in zoos, I’ve kept hundreds of temperate zone species active and breeding year-round for many years. In my personal collection, a number of North American natives, including 30-45 year-old-turtles and salamanders aged 20-35 years, have never experienced dormancy. Animals subjected to hibernation must be healthy, well-hydrated, and possessed of ample fat reserves; a vet exam in early autumn is recommended. Depending upon the species and the size of the individual, pre-hibernation preparation should include a fast of 1-4 weeks in duration (please post below for further information). I’ve had good results by allowing Eastern Box Turtles and American Toads to dig down into the soil and leaf litter within their pens. However, the ground must be loosened in the fall, and I always add a 6-12 inch layer of fallen leaves to the surface. Note: although many people keep American Wood Turtles in largely-terrestrial pens, they spend the winter at the bottom of streams, not on land. The pen should be exposed to rainfall year-round, as terrestrial turtles and toads require somewhat moist hibernation sites. Drainage must be provided…I’ve only left animals outdoors in bottomless pens, so that water does not pool. Red-Eared Sliders, Painted Turtles, Green Frogs, American Bullfrogs and similar species usually overwinter underwater, beneath mud and leaf litter. Unless you are well-experienced or have expert guidance, I would not recommend trying to keep these creatures outdoors for the winter. Dormant turtles absorb oxygen via the cloaca, while amphibians utilize diffusion through the skin. Your pond water’s oxygen level is, therefore, critical, but we have little information on any species’ exact requirements. Water depth is also a concern. Aerators and surface heaters designed for use with koi and goldfish can be employed if you wish to keep your aquatic pets outdoors. You can read more about general winter pond preparations on ThatFishBlog…please see the links below. I have had success in overwintering some aquatic species outdoors (i.e. Sliders, Snappers, Musk, Mud, Spotted and Painted Turtles, Green and Bullfrogs, Northern Watersnakes) but my best results were in large outdoor zoo exhibits rather than backyard ponds. In both my pens and natural situations, I was several times surprised to find American Bullfrogs and Green Frogs hibernating on land – they missed the “go to the pond memo”, I guess! Indoor hibernation is a bit less risky in some ways, as you can monitor the animals closely and avoid the extreme conditions that occur outdoors. However, it is still not advisable for pet-keepers lacking considerable experience. American Box Turtles can be over-wintered in moist sphagnum moss at 38-42 F. A refrigerator designated for this purpose is ideal, but attics, garages and similar areas can be used if temperatures are appropriate. American Toads and their relatives can be maintained in the same manner, but they usually remain active and feeding down to 55 F or so, and so are easier to “keep awake”. Keeping your pets in an unheated or extra-cool room of the house is not satisfactory. At temperatures too low for normal activity, yet above those needed for dormancy (i.e. 50-65 F for many temperate zone species), food reserves are used and the immune system fails to protect from respiratory and other infections. While aquatic turtles and frogs have been successfully over-wintered in aerated water at 40 F, I would not advise taking the risk. Spotted, Wood, Box and Painted Turtles, and others with similar life histories, may be kept active at their normal temperatures year-round. I tend to maintain them at the lower end of their normal active range, but provide a warmer basking site. If the animals are in good health, a dip to 60 F at night will do no harm (different species vary in this regard – please post below for specific information). Temperate zone frogs and toads, including Fire-bellied Toads, American Bullfrogs, Gray Treefrogs and Leopard Frogs remain active and feeding at normal to low (i.e. 55 F) room temperatures. The change from summer highs seems to do them good, and in some cases (i.e. Fire-bellied Toads), may also stimulate breeding behavior. Russian and Greek Tortoises, along with several other species, experience cool to cold winters in some portions of their natural ranges. However, it is difficult to successfully induce dormancy among captives, either in the home or outdoors. Please post below if you wish to attempt this, and I’ll send along specific information. Circadian rhythms, which might be likened to “internal clocks”, govern behavior to varying degrees. For example, Indian Gharials under my care for 14 years refused food in tune with the cool season in their native range, despite being kept at optimal temperatures (they lost virtually no weight during the 3 month period, however). Among pets, wild-caught individuals of certain species may refuse food and become less active even when kept warm during the winter. In some cases, captive-born youngsters of the same animals will feed normally all winter long. Captive born individuals of other species may enter semi-dormancy despite being many generations removed from the wild. For species with large ranges, the origin of the parent stock may be important. I’ve had experience with this scenario in a number of reptiles and amphibians, and am very interested in learning more…please post your observations and questions below. In the Reptile Room section of our Lancaster, Pennsylvania retail store, our expert staff is always creating new and exciting displays. These amazing displays rarely get the exposure they deserve – so we wanted to take a moment and highlight their extraordinary work on That Reptile Blog. Check them out below or stop by our store and see for yourself! This display features the unique Mantella frog (Mantella ebenaui) in a 40 gallon Marineland Perfecto aquarium. 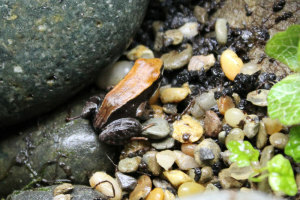 The brown variety of this rare frog is native to Madagascar. The landscape includes river rock gravel, topped with several live plants, including creeping fig, liverwort and begonia. The staff has also included a mini water reservoir with several small goldfish. What makes this set up special, is that the tank is fully sustaining ecosystem that requires no filtration and little maintenance. The system relies on the live plants and gold fish to digest nutrients created by the breakdown of uneaten food and waste. The only maintenance required is feeding the Mantella and trimming back plants as needed. This set up is maintained by several members of our staff, including Josh Mangan. 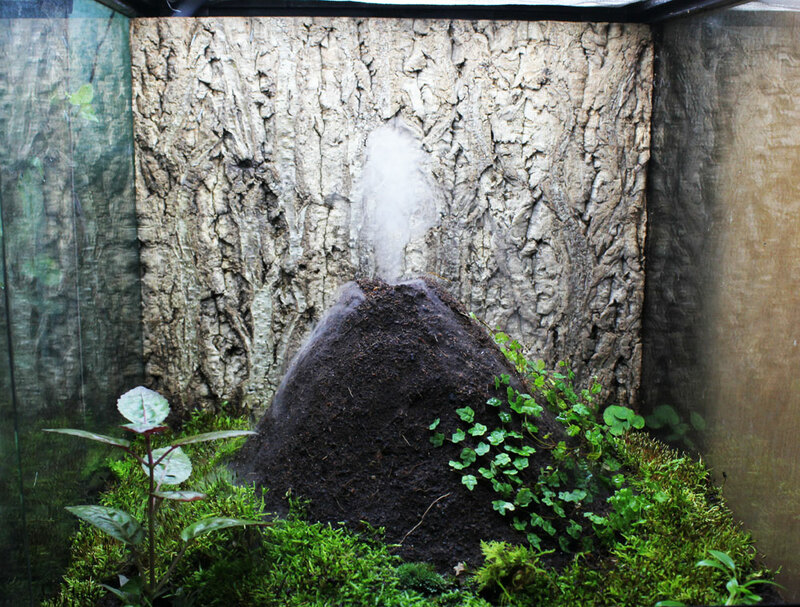 This awesome “active” volcano was handcrafted by our Reptile Room associate Jesse Taylor. 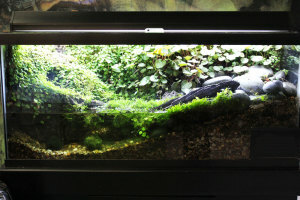 The inventive design includes a Zoo Med Repti-Fogger surrounded by natural Eco Earth bedding. The fogger releases a steamy mist that creates the appearance of volcanic activity. Housed in an 18 in. x 18 in. x 24 in. 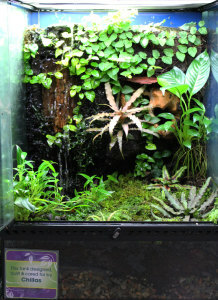 Exo Terra Glass Terrarium, the ecosystem also includes an Eco Earth and live seasonal moss base, as it is prepared to hold African Reed Frogs. 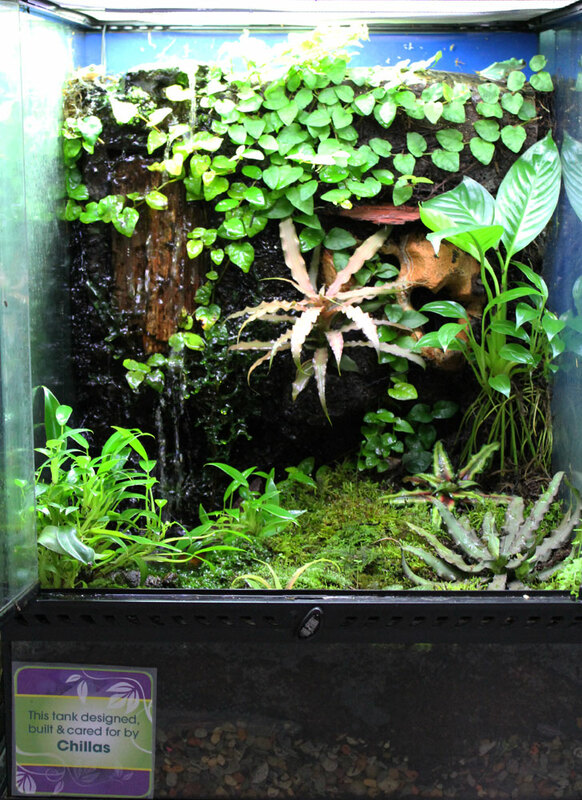 Created by Reptile Room supervisor Ryan Chillas, this great set up features two Vietnamese Blue Gliding Frogs. 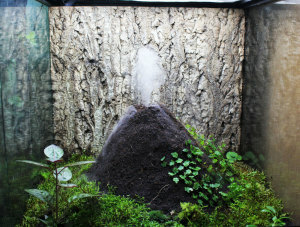 To best replicate the natural environment of the frogs, Chillas created a detailed, natural set up that includes a water reservoir and waterfall. 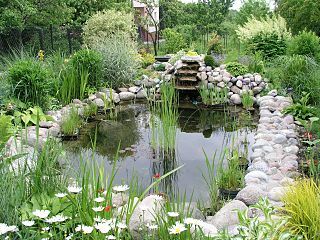 He added a river rock base and several live plants, including creeping fig, liverwort and a peace lily. To create the waterfall, Chillas borrowed some non-toxic expanding foam sealant from our pond section. He used it to fashion a back wall that holds an Aquatop fountain pump. The pump draws water from the bottom reservoir and moves it to the top of the foam wall. Chillas also added petrified wood and rocks throughout the foam wall. 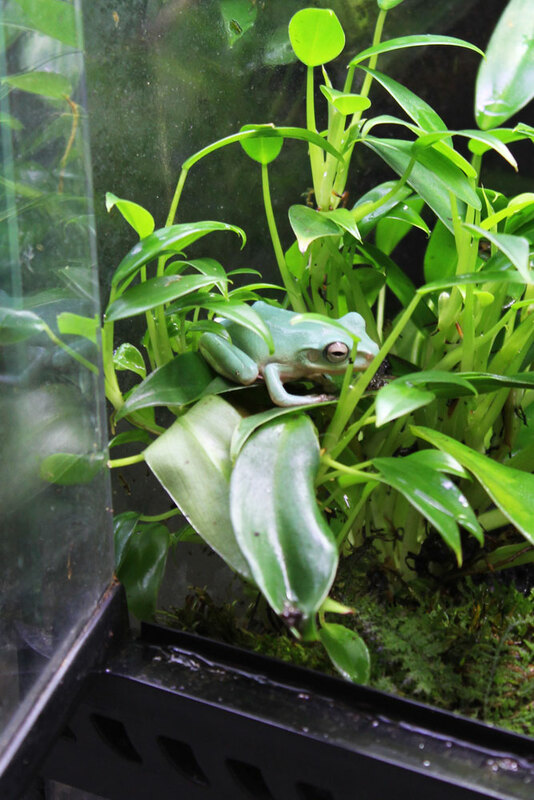 Adding live plants, it creates the perfect climbing environment that the arboreal Blue Gliding Frogs would find in their natural habitat. If you’d like to check out these great displays, stop by our Reptile Room in our Lancaster, Pennsylvania store. In addition to these animals, we also have a large variety of lizards, tortoises and spiders to pique your curiosity. You can check with Josh, Jesse or Ryan in person or speak with any of the members of our helpful expert staff. We are always ready, willing and able to answer any questions you might have! I do not believe that any tortoise species can be classified as “easy-to-keep”, but several are better-suited as pets than others. I’ve covered on of these, the Russian Tortoise (Testudo horsfieldi), in an earlier article (read article here). The Greek Tortoise (T. graeca), while interesting enough for the most seasoned hobbyist, may also be the best pet tortoise, and an ideal choice for first-time keepers. Topping out at 8 inches in length, captive-bred individuals are readily available. They are as personable as any of their relatives, and decades of popularity among European keepers has left us with a good understanding of their needs. I’ll summarize these in the following article, and will also draw from my own experiences with this and related species during my long career at the Bronx Zoo. Also known as the Mediterranean Spur-Thighed Tortoise (not to be confused with Africa’s Spurred Tortoise, Geochelone sulcata), the Greek Tortoise is one of the smaller of the world’s 53 tortoise species.